A little sugar never hurt anyone, right? Research is suggesting otherwise as added sugar accumulating in the American diet at an alarming rate. More studies are finding that added sugar is being linked to chronic diseases, diabetes and obesity; there is a major cause for concern. Sugar can be natural or processed, but it is none-the-less a simple carbohydrate that our bodies use for energy. Even some of the healthiest foods such as fruits, vegetables and diary contain natural sugar. Sugar that is added to foods during processing is referred to as “added sugar”. Sugar is added to boost the flavor, help preserve foods, provide texture and color, or serve as a bulking agent in many products. Added sugar contributes extra calories without adding much nutritional value, which can be a major diet pitfall. Excess calories can lead to weight gain and then eventually to health troubles, which can be a slippery slope for our health. The extra sugar is also linked to elevated triglyceride levels and tooth decays. Filling up on products with added sugar could mean we are missing out on nutrient dense products. What can we do to educate ourselves? The American Heart Association recommends no more than 100 calories per day from added sugar for women and 150 calories per day for men. Recognizing added sugars is our first line of defense. The best way to find added sugar is by being ingredient savvy because simply looking at the nutritional labels aren’t enough. While reading labels can be helpful, it won’t distinguish between added and natural sweeteners. Check out the ingredients, which are listed by weight. If sugar is in the top few ingredients listed, then you are holding a product that is likely high in added sugar. Be sure to also look for cane juice, cane syrup, corn sweeteners (high fructose corn syrup), fruit nectar’s or juices, molasses, malt syrups and honey. How can we limit added sugars in our diet? Try to limit fruit juice and opting for whole fruit instead. Choosing breakfast cereals that contain wholesome grains and fiber are great options, as well as selecting water instead of sodas and sports drinks. Avoid the lure of the vending machine and pack vegetables, fruit, low-fat dairy and whole grain, high fiber crackers to snack on. When in doubt, seek the advice of a professional. Registered dietitians are experts at helping you limit added sugar and navigate the supermarket for the healthiest products. Let a dietitian help you plan and organize meals and snacks to include nutrient dense products while steering clear of added sugars. 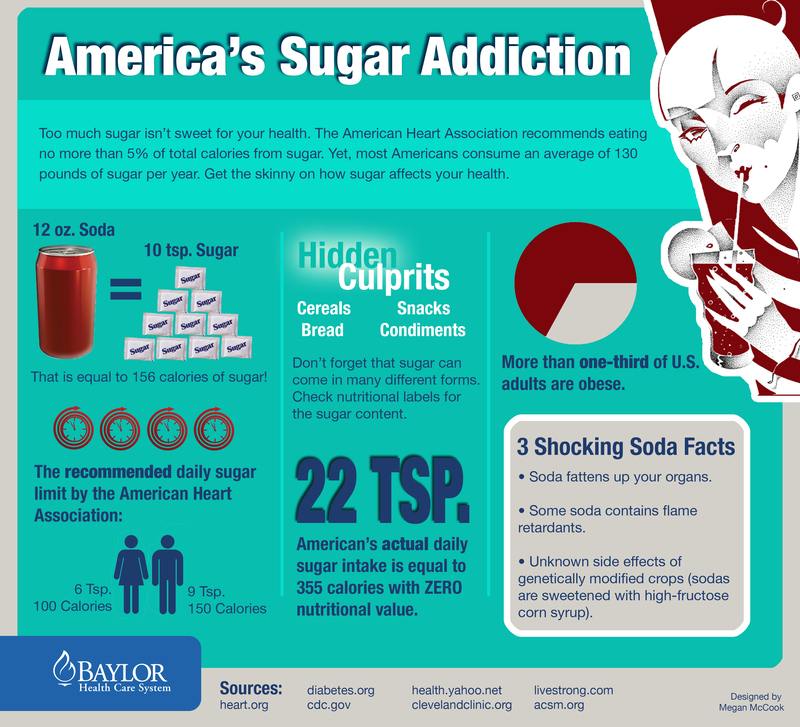 For other sugar stats, check out the infographic below. Previous Previous post: Has The Holy Grail of Weight Loss Been Discovered?